Rome, Georgia is a charming community that is certainly friendly to the arts and is always looking for new ways to introduce more cultural activities in the area. With the gardens of Oak Hill, the Martha Berry Museum, Myrtle Hill Cemetery, historic Desoto Theatre and Berry College campus this town has a lot to boast about. Though small compared to larger cultural cities such as Atlanta, it is a town that appreciates creativity in its area. That appreciation is what makes Rome a perfect and unique opportunity to host the Rome International Film Festival. September 4-7, the Rome International Film Festival, or RIFF for short, offered a chance for movie lovers of all kind to come and spend a few days appreciating the magical art of film. Opening night of the festival began with No Ordinary Hero which was made by a deaf director and deaf executive producers. RIFF has a partnership with the Georgia School for the Deaf and many of the students were in attendance for the film viewing. Other than films, workshops were given by professional and experienced filmmakers. One in particular was director and screenwriter, Shawn Telford, who comes from a background of acting and has worked in theatre, television, and film. Telford’s feature film B.F.E. was Saturday night’s closing film and had an outstanding turnout. Compared to other festivals Telford said one of the first things he noticed about Rome, Ga. was how friendly the atmosphere is. 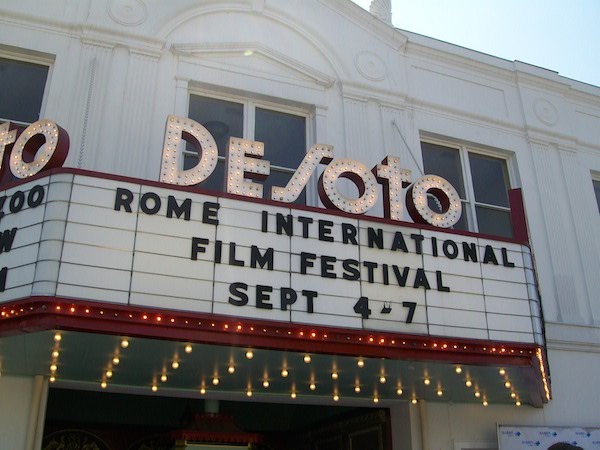 “It’s very friendly, well-organized and takes place in one location, and it’s a beautiful location.” The venue used to show the films for this year’s festival was the historic Desoto Theatre. It was built in 1927 and was the first theater in Georgia to feature talkies to the public.